Amsterdam, Stedelijk Museum; London, The Tate Gallery; New York, The Museum of Modern Art; Chicago, The Art Institute; and Los Angeles, County Museum of Art, Willem de Kooning, September 1968-September 1969, no. 140. New York, The Whitney Museum of Art; Berlin, Akademie der Knste; and Paris, Muse National d'Art Moderne, Centre Georges Pompidou, Willem de Kooning: Drawings, Paintings, Sculpture, December 1983-September 1984, p. 67, no. 64 (illustrated). Boston, Museum of Fine Arts, Contemporary Drawings from Boston Collections, November 1986-February 1987. 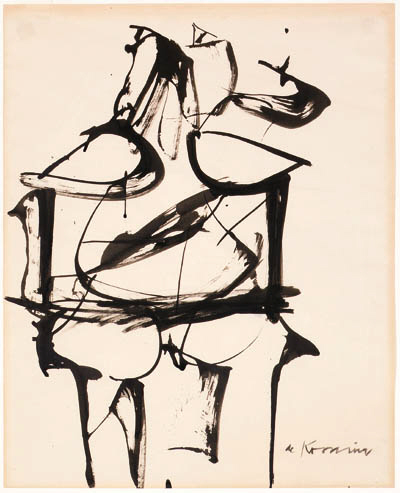 Although de Kooning had a sustaining interest in the figure --both male and female-- throughout the early years of his study and career, he did not begin what would be considered his signature, mature Woman series until 1950. In pursuing this subject, concurrently with his abstractions, he placed himself in a long tradition of artists who actively explored the female subject. One recalls not only Titian, Rubens, and Ingres, to name a few, but also the anonymous sculptors of the classical world and the prehistoric epoch. De Kooning's Women are voluptuous, like fertility goddesses, and often isolated on the page like the pin-ups of popular culture. They are usually presented frontally, a characteristic which would strengthen towardst the end of the 1950s. Here, the figure is faceless, just a toss of hair, arms folded in nonchalance, isolated in the space, inviting yet dismissive as if defiant of the voyeurism which might be implied through association with other images of women, such as the pin-ups. De Kooning maintained that he did not subscribe to this viewpoint: "My paintings. . . are supposed to make me a matricide or a woman hater or a masochist and all sorts of other names. Maybe I am a little bit like other men, but I certainly wouldn't show it off in my paintings. I don't believe in Venus at all. I am not interested in Greek mythology." (De Kooning, interview with Harold Rosenberg, 7 February 1971, quoted in P. Cummings, "The Drawings of Willem de Kooning," Willem de Kooning: Drawings, Paintings, Sculpture, exh. cat., op. cit., p. 19). Nevertheless, these images remain charged with a long tradition of cultural associations which, although they may be rebuffed, cannot be discarded. Early in the decade de Kooning experimented with pastel in both his figural and abstract drawings as a means to play with the spatial and tonal aspects of them. He often built up a complex configuration of erasure and pentimenti to create space and movement in the figures; shapes were formed by the resulting light and modelling . Here, however, he has employed brush and India ink which, with its stark contrast on the smooth paper emphasizes the speed of the artist's gesture and his sureness of line. As Paul Cummings has observed, "Line became the key element in the evolution of his style, a style which resulted from an act of will. Will resolved the intellectual conflict between classical restraint and expressions of violence. This allowed his to remain himself, yet be open to any influence to which he responded. His art became packed with imagery, fragmented, distorted, whole, or invented, stated in an enriched vocabulary of line." (P. Cummings, op. cit., p. 15). This drawing represents a single, complete thought, executed rapidly and decisively with no room for mistake. The flat, swift strokes emphasize the surface of the sheet, yet also create the contortion of the woman in the space. Once the woman is placed on the page, it is she who creates the space, gives it life -- there is nothing else to suggest it. De Kooning's aim was not to destroy the figure completely. Regardless of its fragmentary restructuring, it retains some likeness of what it is --a body-- and, moreover, the essence of what it is --a woman.